This is Part III of the summary and results of the MQA Core decode vs. standard PCM Hi-Res blind test following from the "core" results last week. At this point, we know that if we look at the "big picture", evidence suggests that there are minimal audible differences. So if we dig into the data set a bit further, let's see if we can ask questions based on the subgroups identified. I'm sure many of you have been curious about some of these questions for awhile but until having access to a large enough database such as this, it's difficult to obtain answers. I. 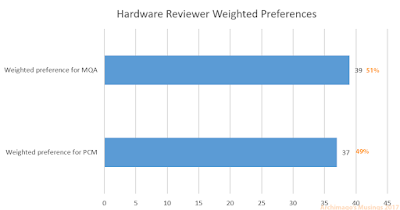 Did musicians, audio engineers, self-identified audio hardware and music reviewers show any strong preferences? There were a total of 17 musicians, 13 audio engineers, 11 hardware reviewers, and 8 music/album reviewers in this database. Note that there is some overlap but for the sake of simplicity, let's not worry too much about this here. Let's do what we've done before and calculate the weighted totals so we combine as much data as possible (preference + rater confidence). Remember the weightings: 1 point = "essentially no difference", 2 points = "slight difference", 3 points = "moderate difference", 4 points = "clear difference". Interesting. In the weighted results, we see that musicians seemed to have a preference towards the PCM samples whereas there were varying amounts of preference towards MQA Core with the other smaller subgroups. Folks who self-identified as writing audio hardware reviews were quite balanced and essentially 50:50. 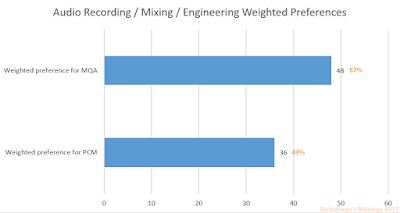 The most skewed results were the audio recording / mixing / engineering folks who preferred the MQA version more (without applying the weighting, with 13 "engineers" and 3 tracks each, there was a total of 18 votes for PCM compared to 21 MQA; interesting skew but not particularly large). Realize that these are small sample sizes and with the weighting system applied, wider swings in values are to be expected. II. Did price of the playback system result in a difference in preference? This one should be interesting. Remember that often there seems to be this desire to correlate price with sound quality especially in some of the industry-affiliated writings out there. So, within the dataset, is there any evidence that those with more expensive systems like those who used US$5000+ gear select a result much different from the average? In total, there were 34 submissions from people using >US$5000 systems. Lumped together with 34 submissions, 3 tracks each, with no weightings applied, there was a preference of 56 PCM (55%) to 46 MQA (45%). Using a one-tailed binomial test of significance assuming a 0.5 probability of outcome (ie. flip of a coin) the results are z=0.89, p=0.186 - not particularly significant with probability of seeing this level of outcome in 18.6% of random coin tosses. 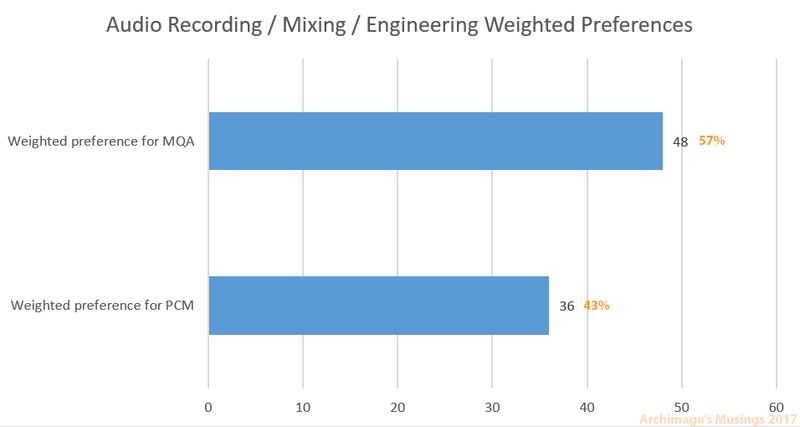 Overall then the folks with more expensive systems showed a propensity towards the standard hi-res PCM sample with a weighted score of 54% compared to 50.5% when we include listeners testing with <US$5000 systems (as shown last time). Though not necessarily significant, it at least suggests a trend towards preferring the hi-res PCM if you have a more expensive (and presumably "better") audio system which was maintained when weighted with the confidence data. Clearly this is a different narrative than the claims of "hi-end" writers. III. Was there a difference between using speakers vs. headphones only? From a time-domain perspective, this is useful to know because headphones are typically simpler and allow the listener to experience a more direct sound from the drivers without the effects of the room which can be very significant! There were 7 listeners who used both speakers and headphones excluded from this analysis. 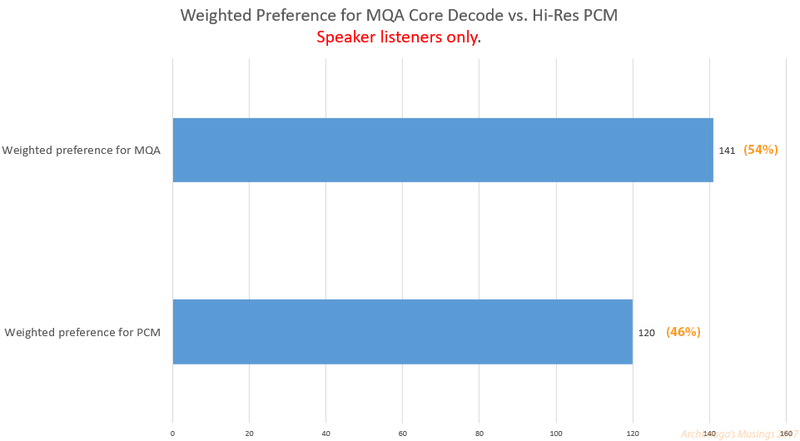 It appears that MQA is preferred by the 50 speaker-only listeners but conversely the headphone users preferred the PCM samples! Note though that there were fewer "headphone only" listeners so results would be more easily skewed especially with the weightings applied. When we take away the weightings for the headphone group, it was only 40 PCM : 38 MQA. 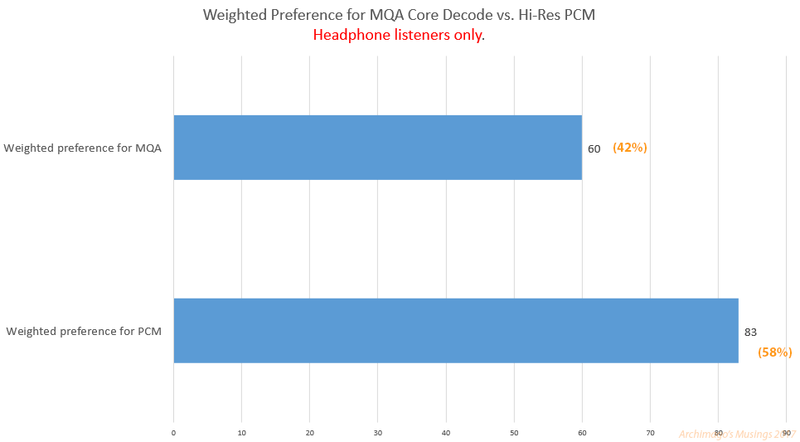 Basically what this means is that some headphone listeners declared that when they heard a bigger difference between the two, it was in the direction of a hi-res PCM preference. IV. What did the younger group hear? Segregating respondents into age groups can be a bit tricky. But let's face it, given the choice I would want to have the same hearing acuity as when I was 20 or 30! 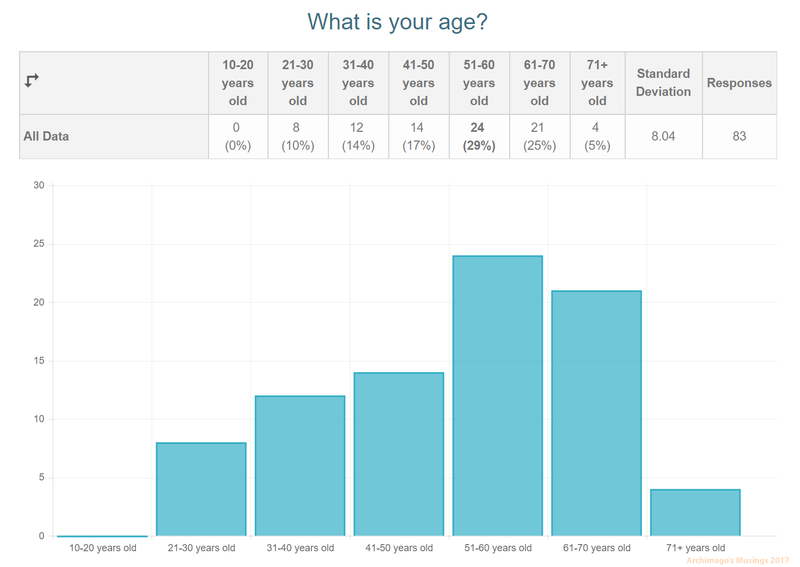 We have a group of 20 "younger" respondents from ages 21 to 40. I wonder how those guys managed with this test in terms of their weighted preference? As you can see, overall they had a stronger preference for the PCM samples when combined with the confidence weightings. 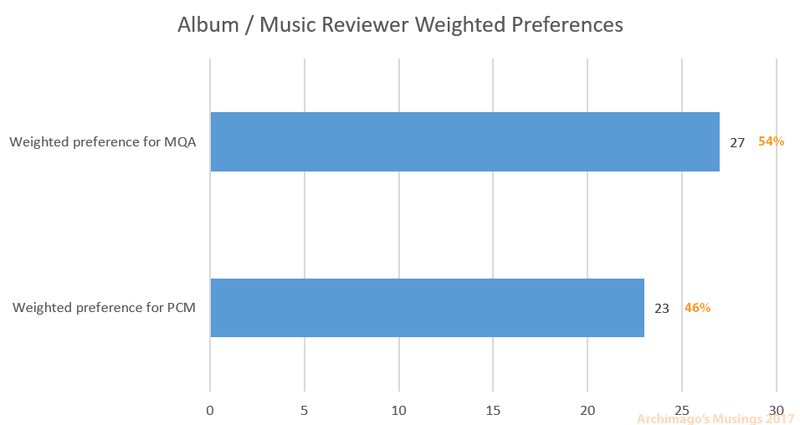 The interesting thing I found with this subgroup is that the preference was towards the hi-res PCM samples for all 3 tracks, plus the weighted scores pushed it towards the PCM samples even more. I had not seen this stronger tendency with every track with the other subgroups. With an n of 20 only, it would not be wise to make too much of it other than to earmark the result perhaps for further study. V. What did the "Golden Ears" prefer?! Alright guys, let's now look at the "golden ears" group of listeners :-). These are the guys (alas the one lady respondent did not make it into this hallowed cohort) who were able to select all 3 MQA Core decode or all 3 Hi-Res PCM samples "correctly". Remember that even with a flip of a coin, we expect out of 83 listeners that 1/8 of them (10.4) will be able to "guess" the 3 PCM or MQA samples. Well friends, I think we've found our "Platinum Ear"; the proverbial "needle in the haystack"... Indeed, this individual selected all 3 MQA choices! Good job man, and achieving it with total equipment cost in the "$2000 - $5000" range using a pair of Grado SR 80 headphones! Apparently no need for a megabuck audio system. Please PM me on Computer Audiophile, I want to learn your Jedi listening secrets. Very impressive. That's interesting because on the whole, this "golden ears" group actually showed quite a bit more confidence in their answers compared to the overall data set of all respondents (again, see the post last time for a comparable graph)! Nonetheless we see that 57% of comparisons still only suggested slight audible differences and although the "moderate" group is quite large, those who offered that they heard a "clear" difference in these golden ears were only 8% of comparisons, no different really than the 7.6% of the total respondents from last week. Pretty evenly matched except for musicians and their higher Hi-Res PCM preference. Well, there you have it. Some subgroup analysis of the overall data. On the whole, I think it's clear again that I'm certainly not seeing an "obvious" preference for the MQA Core decoding compared to the same recording at 24/96 Hi-Res or downsampled to 24/88 from DXD using the 2L samples. As discussed in the procedures post, remember that I have standardized all tracks to the same MQA-like upsampling filter to remove this potential variable. 1. The "audio recording / mixing / engineering" group of listeners did seem to show a larger preference towards MQA. 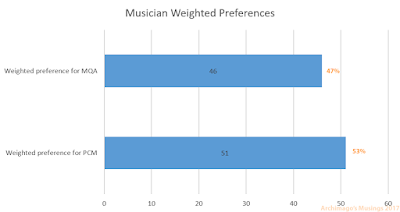 However, the slightly larger group of "musicians" did not show this same preference. 2. There was an overall preference for MQA with those using speakers only, but headphone folks seemed to have a stronger preference to PCM. So what does this mean? Probably nothing... But I suppose MQA proponents could say this is the result of better imaging or soundstaging when listening with speakers. But then again, headphones can convey better resolution. Maybe what's needed are comparisons with MQA vs. PCM binaural headphone listening for both high resolution and to look for subtle time-domain effects? 3. Folks with more expensive systems (>$US5000) overall had a preference for the PCM samples. Again, this seems counter to the claims of audiophile writers who almost universally prefer MQA despite mostly using expensive gear. If truly MQA improves resolution at the level of time domain, shouldn't folks with more expensive equipment tend to hear the benefits? Lots of possibilities here of course, one of which must be that price and sound quality do not necessarily correlate. Another possibility is that in fact the ones with expensive gear are getting benefits but they're not liking the partially-lossy nature of MQA or that it's affecting the noise floor! 5. The "golden eared" cohort (either selecting all MQA tracks or all hi-res PCM) showed more confidence about their preference. But actual preference is difficult to gauge. There were overall more "PCM-preferring golden ears" than "MQA-preferring golden ears", yet one fellow who also did well on the 24-bit blind test awhile back rated a "moderate" preference towards the MQA :-). 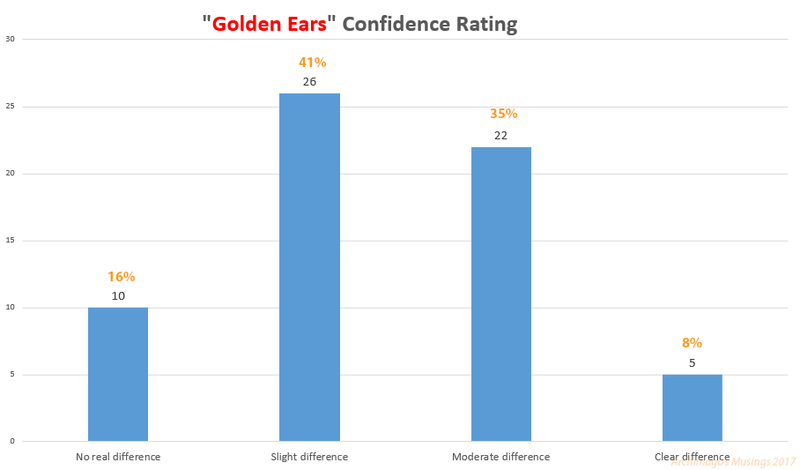 In any event, even the "golden ears" thought that the difference heard was at best "subtle" more than 50% of the time. As suspected in Part II, we were not likely going to see massive divergences between the PCM and MQA Core results although the findings above I think are interesting and certainly can provide some direction if one wanted to take a next step and run controlled testing (in a lab). For example, let's find 20 audio engineers / trained listeners and run them through a blind listening test to see whether the slight preference towards MQA remains with good equipment. Who knows, maybe the MQA folks have already done these kinds of rigorous studies... It would certainly be interesting if such results were to be published and replicated. 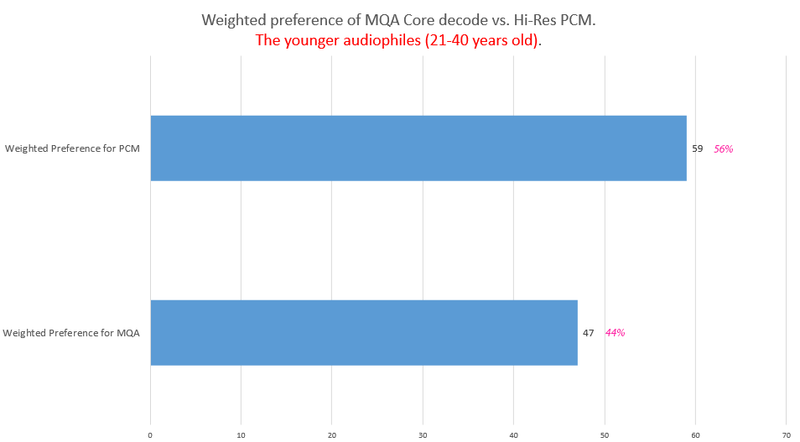 As you can see, the subgroup analysis does provide interesting results for both MQA and standard Hi-Res PCM proponents; this is to be expected when we're exploring subtle differences at the margins of audibility. 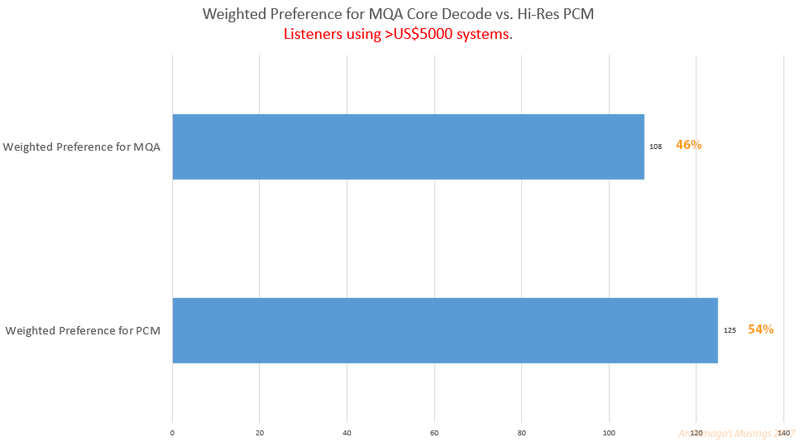 Overall though, I think the dataset still points to preference for standard hi-res PCM over the MQA Core decode when we take into account subgroups who should be better able to discern higher resolution. Statistically, the database seems to suggest that younger musicians (<40), using more expensive gear (>US$5000), listening with headphones would more likely prefer the hi-res PCM. Conversely, older audio engineers, using less expensive equipment with speakers seem to like MQA Core decoding more. You decide which group you're closer to :-). Either way, nobody should be impressed with any great audible differences! Okay then, next time, let's finish off the blind-test write-up with subjective comments from the listeners and how they would describe what they heard. I am one of the "golden ears" who picked the PCM file as better in all three cases. While I have to admit I had a really had a hard time discerning the differences, it is also important that each of five times I sat down to listen (far enough apart that I actually forgot my earlier scoring, thanks to a long test period) I had the same results. During the test period I purchased a MQA capable DAC (full unfold to 192/24) and downloaded the original 2L files you used (in 44/16, 96/24/ and MQA). I had similar difficulty telling them apart, even with full "unfolding". There are very slight differences from 44/16 to 96/24 (as you might expect? ), but between 96/24 and full unfold, not so much. At least with my $2500 headphone system. Great job. And I think it's testimony like yours that I've never heard of in the general media. Archimago, have you taken into consideration people who made audio analysis beforehand and "cheated" by running the files through spectrum analysis, phase, or null-testing? Hard to account given the way the test is done. No way to know if people did this or not. The folks who described in detail what they did certainly did not seem like they were "cheating". This is why if one were to take a step forward it would be to select a group of musicians, audio engineers, and trained listeners who have excellent acuity to listen and perform blind testing. Having said this, it is interesting that the "golden ears" group did not deviate from expected too much! 10 expected Golden Ears in each group... We got 9 MQA Golden Ears and 12 PCM Golden Ears. If there was cheating involved, it didn't seem to happen too much I think. Anyone can tell me what tool they would use to differentiate the MQA decode vs. standard PCM if they wanted to? "Remember that this is not necessarily statistically significant so there's no need to make a big deal out of these findings." Might I suggest this be rewritten in all caps, and placed at the top of the article? Because none of this even establishes a compelling case for audible difference, in which case the 'preferences' are imagination-based too. Well, considering I said this kind of sentiment a number of times through the article, I think I have embedded the idea reasonably thoroughly! All "preference" is imagination-based. The only ultimate generalization we can make is within group effects which is of course the attempt we're making here. Thanks for doing this test and to those, like myself who contributed. It is in my experience that MQA does not offer any significant improvement over PCM. Also the results show that 2L's quality does not need MQA and sort of proves my comment a few weeks ago that when the quality already exits, MQA does not have anything more to offer. I will of course stand corrected over much older material that may benefit from the de-blurring process, as equipment in the past may have been insufficient and therefore correctable today with new processes and equipment. In any case, I still feel that MQA is not the sort thing the industry should be doing in terms of quality. Older recordings have been mastered time and again, many with beneficial results (Albert King is my favourite example) but these recordings remain steadfastly non hi-res. It is the music being made today that should be given proper recording equipment and work processes, so that re-mastering is not required and the public get high quality straight out of the studio. I recently acquired a Goldfrapp (latest) album @ 24/48 and it sounds amazing, no distortion when turned up and exquisite at normal listening levels. Similarly the Kraftwerk box set recently released, again in 24/48 sounds utterly amazing. These 2 examples are proof to me that given the right equipment in the first place recording today can sound brilliant and do so when played back on "affordable" equipment (~ £500 to £1500), also likely, completely amazing on more expensive kit. Just seems to me that MQA is trying to say that music reproduction had been wrong all along, both these recent recordings I refer to and your test confirm that MQA is just another way of doing the same thing. Ultimately for all of us it is a matter of choice using your ears and whether someone chooses MQA or not doesn't really matter, just so long as what you hear pleases you and drives you to enjoy listening. However I for one will not be worrying about MQA, I am satisfied that I am not missing out. I don't know about you but I think the discussion over MQA has run its course and people will choose with their wallets. Thanks for the note Gordon. I completely agree. What musicians, engineers, audiophiles and ultimately the public needs to fight for is sound quality right from the start. Audio projects being captured well, mixed with an eye to minimize distortion, and mastered to levels that maintain low noise and maintenance of nuances. Of course, not all projects require high resolution and not all music needs to sound natural - artists' choice. Thanks for your input. I assume the Goldfrapp album is "Silver Eye". I'll have to look for that one and listen! Yes it is Silver eye and I hope you enjoy it. I agree that not all music needs hi resolution, as others have pointed out in this conversation, CD does give an excellent fidelity, if the recording has been well produced. All I hope for is that the quality of music goes up, and that the likes of the equipment used at 2L as well as their production values moves to other genres. The main reason behind my wish for hi res across the board is to see an increase in quality regardless of the price band, someone buys music at, or the equipment they play it on. The current generation of 20 to 30 year olds, have a plethora of great sounding equipment to choose from, at reasonable prices. My desire, if you will is to see/hear that equipment driven by great sounding recordings, regardless of genre, or indeed, as you rightly pointed out, artistic choice. Even the most crass of guitar sounds or chaotic music can still sound great when treated properly in the first place. Anyway, thanks for the opportunity to voice my opinion and I look forward to more of your work as time goes by. the more I listen to different audio formats, the more I learn about it, one thing becomes clear: CD quality audio is very likely as close to perfection as it can get, regarding 2 channel stereo. The point is, current music recordings do not nearly utilize halve of the potential of CD quality. Sound quality is lost in the mixing stage and in the mastering stage. When all music is compressed to death, clipped and peak limited. Hi-res audio will not remedy the situation. I do music recordings myself. I recorded a piano, with dynamics ranging from softest lowest volume of stringes barely touched by hammers, until the loudest that piano could produce, with keys hit hardest as possible. Measurements of a Grado SR80: http://en.goldenears.net/3817 which looks similar to the generic emulation of another Grado, on a calibrated headphones plugin [ https://picload.org/view/dglagpgr/grado_1000.png.html ]. Please note, that these graphs would need translation to what is perceived via loudspeakers; since the ear canal has a huge impact especially in the high frequency regions (measurements with dummy heads are usually made at an artificial eardrum-position). Yeah, I own a pair of Grado SR60's myself as the very 1st "audiophile" headphones given to me as a gift something like 20 years ago. Indeed they have a "sound" as shown in your picture with both a bass and treble hump on testing. This morning I was contacted by our "Platinum Ear" listener. I am impressed, what a gracious gentleman with a spirit that comes through in his message! A highly educated individual with a science background, balanced in the arts with piano and choral experience, and also acts as a critical listener beta tester for a company that models piano and percussion instruments! He acknowledges a concept similar to yours; that the Grado has a unique signature with that hump around 9kHz and the difference between the MQA and PCM was audible around that higher frequency. On a more neutral headphone (like the AKG K702), he found the difference less noticeable. "I read the heated discussion in part II of your test, and I’m in no way advocating MQA. I still believe the enjoyment in music comes from great musicians and great sound engineers using better and better microphones. All of this can surely be captured in the CD format, with an advantage when multi-channel is available, but I take pleasure in listening to normal well-recorded CD’s as well." IMO, important words of wisdom. "He acknowledges a concept similar to yours; that the Grado has a unique signature with that hump around 9kHz and the difference between the MQA and PCM was audible around that higher frequency. On a more neutral headphone (like the AKG K702), he found the difference less noticeable." That's really interesting, but disturbing if true. 9kHz is well-within the audio band. If MQA and PCM differ audibly in the region around 9kHz, then that sounds like a serious defect. As the recently nominated "Platinum Ears" reader, I did send you a PM to your Computer Audiophile address as asked. You left your message while I was reading yours to me on CA and posting the note above! How does MQA 'deblurring' compare to Plangent processing, which operates earlier in the A/D chain, and acts on analog wow and flutter? it looks like this is mainly a way to minimize the wow & flutter by maintaining speed accuracy when the tape is played back to the ADC for digitization. 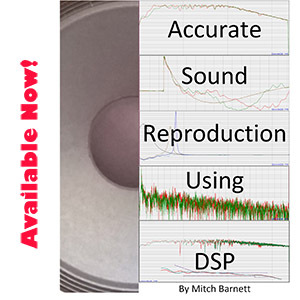 Yes, Plangent operates on tape output -- AFAICT it is DSP that relies on a purposely or accidentally recorded constant tone (e.g., a bias tone or some constant buzz) as a reference, to correct fluctuations. The point I was going for is that the time-domain distortions that Plangent fixes are objectively grossly larger than what MQA claims to fix. And yet (having heard before/after Plangent files) often at best subtle (which is to say, possibly inaudible). And then let's consider the even grosser time-based distortions that vinyl recording and playback entail. And yet many of the cheerleaders for MQA write for journals where vinyl is considered the gold standard for sound. Recently I've done ABX tests at home and trying to find differences got me tired real fast and it was not "enjoying music moments". So who can hear those subtle differences while listening to music for the sake of listening to music? Is there a link with trained ear, like : once you're able to ear a particular thing you'll always notice it? Does it mean that the more you train your ear the less you'll enjoy day to day music? You actually bring up a good point about ear/listener training. Does anyone know if there is a "course", perhaps online where someone desiring to upgrade listening skills can take? A course that teaches the vocabulary as well as examples to listen for... Audiophilia 101 pre-requisite for all audiophiles to take and pass as a basic level of listening proficiency :-). I recently created a basic procedure to install foobar2000 + ABX comparator. One of the goal is train ear as well as giving exemple for clipping, compression, etc. I guess comparing files of different qualities or condition mayb help for a training. The informations is available but not centralized, I think it would be good to regroup this information and share it. Only problem I have now is to create files, I need to learn how to use audicity and create the desired effects. I shared my procedure on two forums but didn't a lot of participation (Once I'll share files i guess it will help), but I'm getting views. Archimago, are you looking for something like Harman's How to Listen? Thanks for the "How To Listen" link! Will have to check that out :-). Yan: Sounds like an interesting idea! Let us know when you're ready to launch! Thanks Balduin for the link about Ethan's book. I didn't know that the were files attached to it. I already found good files on his web site. Good work. I am concerned that most manufacturers are simply content to use the filters that come with the DA chips they buy off the shelf. Few if any devote effort to eliminating the audibility of filter effects. If you are ever in Calgary then don't hesitate to contact me for a system demo. Sure Jeremy... I have some family in Calgary so make it there every once awhile. "5. The "golden eared" cohort (either selecting all MQA tracks or all hi-res PCM) showed more confidence about their preference. ... There were overall more "PCM-preferring golden ears" than "MQA-preferring golden ears", ..."
This sub-group analysis would prove, MQA is worse than PCM...? Even, with "golden eared" audiophiles...? Isn't that a knock-out to MQA? Well, it is what it is... Whether by chance or if there really is true "signal" in that number, more people consistently were able to identify and preferentially choose the hi-res PCM version out of 83 listeners than the MQA version by 12:9. Engineers had an idea of in-band signaling, just like what HDCD did. That's what MQA does: It uses the least significant bits of a 16 bit audio signal, to encode something. In this case, audio content above the 44.1kHz or 48kHz sampling frequency. If not decoded, the lower 3 or so bits are used for that encoding, and sound like noise. The effective resolution of 16 bit audio with MQA encoded content then would be only 13 bits or so. * 1st, the believe in ultrasonic sound required for audio. * 2nd, slow internet connections. The 1st pre-requisit is very much questionable. There is a blind test conducted by members of the AES with roughly 60 subjects interessted in high quality audio, whether the ultrasonic content in DSD/SACD provides any benefit over CD quality. The finding was: No, it doesn't. And the 2nd pre-requisit, the slow internet connections, just vanished with newer DSL with high-speed internet. So, they invented the "time-smear" "problem". Which simply is non-existant, but they desperately were in dire need of a "problem" their MQA could "solve". Remember: A 16 bit audio file with MQA encoded content is effectively only 13 or so bits of resolution. So, that's better than standard 16 bit resolution of the CD? Now, we don't need to understand how MQA works. We just need to trust our ears. We just need to listen to the music, instead listen to the marketing buzz of MQA and their related claquers and shills. Real listening tests reveal: MQA does not provide any benefits to sound quality.